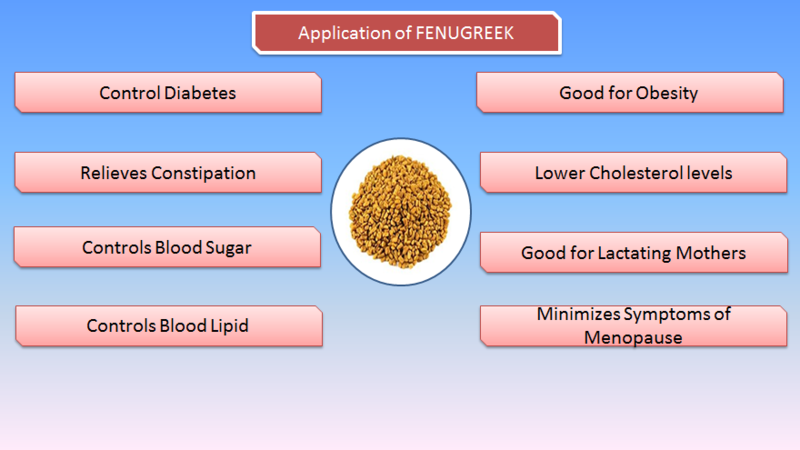 The fenugreek also referred as the Trigonella Foenum – grecum L, has been marked as one of the most promising plant in terms of nutritional and medicinal value from the ancient times. The plant is an annual herb indigenous to the eastern shores of the Mediterranean regions and countries like the Saudi Arabia, Egypt, India and morocco. The plant seeds contain steroids, sapogenins and diosgenin being major constituents. These sapogenins are glycone portion of plant steroid. These constituents occur as complex glycosides and not free molecules. Recent research shows that the fenugreek seeds has up to five different types of flavonoids, which the vitexin , tricin, naringenin, quercetin and tricin. The seed has also been found to have strong antioxidants such as the quercentin, which has anti-inflammatory, anti-oxidant, anti-tumor, anti-ulcer, and many other medicinal properties. The gum contains trigonelline, and alkaloid which is a derivative of the nicotinic acid. This chemical has hypoglycemic and ant pellagra effect important in the management of diabetes and diseases affecting the central nervous system. The fenugreek also when consumed has an effect of refining the blood as a diaphoretic. It is able to pass on sweat and thus help to detoxify the body. As a lactation aid, the fenugreek has been found to be able to stimulate sweat production as it contains hormones which enhance milk production in the lactating mothers. This happens in duration of 24 – 72 hours after ingestion of the herb. As an anti cancer aid it has been found that the diosgenin acts to reduce the growth of anti cancerous cells in the body. From a compositional research analysis, the fenugreek seeds have been seen to be high in carbohydrates but low in protein contents. A dried sample of the seed has been seen to contain a moisture content of approximately 10.9% while that of crude fat is about 6.3%. The seeds have been observed to contain vitamin B1, B2, B6B12, folic acid and vitamin c. The total amount of carbohydrates has been seen to be approximately 77.04 %. It has also been found to have an ash content of up to 2.99 %. The presence of stalone in the gum causes it to have flavor, which is important in some of the recipes. In addition to the medicinal and nutritional applications, the fenugreek forms very stable colloids and for a long period of time. This hydration property makes the fenugreek an equal alternative to hydrocolloids. Since the product is widely grown in India and around the world, it can be used in place of other seed gums. 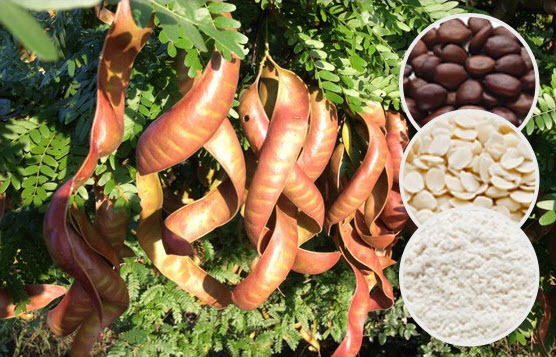 The cassia gum is purified flour from the seed endosperm of cassia tora and the cassia obtusifolia, which are plants of the leguminosae family. 75% of the powder chemically contains high molecular weight polysaccharides with mannopyrannose units linked with galactopyrannose units. These make it exhibit excellent properties of a hydrocolloid. The manufacturing process is a series of steps involving the cleaning of the source material, removal of impurities, milling and further refining with isopropanol to have a final purified product. The final refined cassia gum is significantly different from the other galactomanans in that it has fewer galactose molecules next to the long mannose chain. 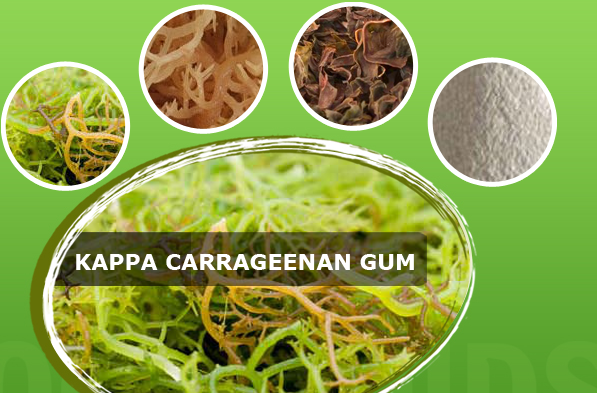 This creates a significant effect on the synergy of the food grade cassia gum with other anionic food gums such as carrageenan or Xanthan gums. Scientific research has shown that a high number of galactose side chains hinder proper synergistic gelling effects with anionic polymers. To counter this effect, a smaller amount of hydrocolloid blend with cassia gum is required for a similar effect to be achieved in the food product as with carrageenan alone or blends of carrageenan and other hydrocolloids. In regards to the chemical structure of the gum, it is stable during food processing and storage. The product only degrades into sugars, but this happens rarely. Scientific research on degradation of the cassia gum in food products shows that it is stable without chemical modifications for over 20 months. When the gum is used at the recommended levels in food, it has been seen to have no interaction with nutrients. There is no other seen by products of the degradation process of the gum apart from sugar formation. In cheeses, such as curd, whey, cream, processed spread, dip and other miscellaneous cheeses, it is used at a maximum level of 3 mg/kg as an emulsifier, stabilizer, thickening agent and water retention agent in these formulations. In the frozen dairy desserts and mixes, the gum powder is used at a level of 2.5 mg/kg as an emulsifier and stabilizer to control over run. These products include ice creams, ice milks and sherbets. In the meat products and meat formulations and dishes, it is used at a level of 3.5 mg/kg as a stabilizer, emulsifier and water retaining agent. These include multi coarse meat meals, sandwich ingredients and commercially processed meat ingredients. In poultry products it is also used at a level of 3.5mg/kg as a stabilizer and water retaining agent. These include all poultry containing dishes frozen products and sandwiches. 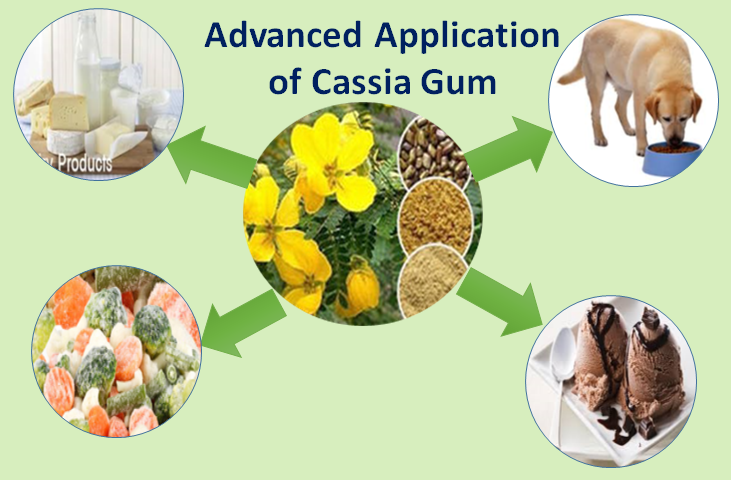 Continued research on the cassia gum powder uses and applications has led to the conclusion that the gum can be equally used as replacement to other hydrocolloids and in some cases it is more effective. Research has also proven that the gum is effective when combined with other hydrocolloids such as the carrageenan and the xanthan gum. In addition to human food additives, it can also be used in the manufacturing of pet foods. Hydrocolloids are water soluble and dispersible polysaccharides that are also referred to as food gums. The products also produce viscous dispersions called gels. In usage they basically bind/ hold water, improve texture of products, stabilize emulsions and form films as well as product coatings. They have a mannose backbone linked to galactose side groups. The ratio of the galactose to mannose varies from 0.3 in carob to 0.6 in guaran to 0.9 in the fenugreek gum powder. 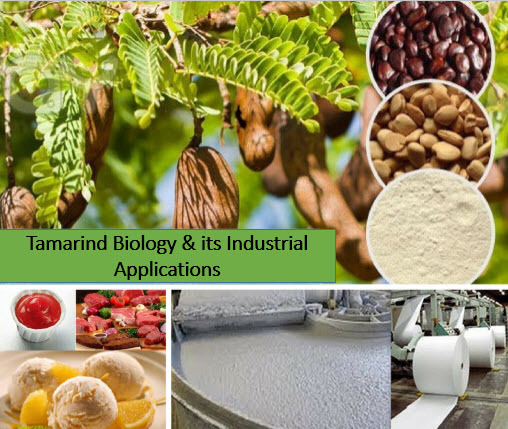 The guar gum powder is mainly produced in India and Pakistan and extracted from the seed endosperm. It hydrates rapidly in water to give a viscous solution that has a neutral PH. It is widely used in many industries due to these properties. The plants also grow widely in the Middle East and the Mediterranean regions. It is also a galactomanans with the ratio of mannose to galactose being at 4:1. The side chains in this case are never uniformly distributed with some sections of the formula being referred to as hairy while others are bare of the side chains. It is also widely used in the food processing such as ice creams, cheese products, meat products and chocolate products. Harvested from trees and mostly occurring in the semiarid areas of Africa. It is also widely used in food industries such as candies, baked goods to reduce moisture absorption, frozen desserts and also flavor fixation. Other in the same group includes the fenugreek gum and carrageenan gum. Alginate; sourced from the brown algae and has applications in the food industry such as salad dressings, meringues and bakery icings. They are considered more expensive than the plant based hydrocolloids. These are basically derived from chemical combinations to give a product with similar structure to the natural polysaccharides. Semi synthetic hydrocolloids are more preferred compared to the purely synthetic gums. They include the starch derivatives such as the hetastarch, starch acetate and starch phosphates. Cellulose derivatives include; carbxy-methyl cellulose, hydroxypropyl methylcellulose (HPMC), methylcellulose (MC), and microcrystalline cellulose. The natural gums are the most preferred in all the industries due to various reasons. Bio degradable; they are renewable sources which are easily bio degradable. Low cost and easily available in nature, they are also easier to extract. They have more public acceptance due to their numerous health benefits and they are also extracted from edible sources. With all these advantages, the natural hydrocolloids are gradually replacing synthetic gums in industrial applications.